I know, it's a superstition... and no, there is nothing wrong with the number 666... I just don't like it. And when I saw I had 666 posts, I thought I would post something to get me to 667. My mom got an email from my Aunt Chrissy asking about Deacon's hair... she likes it buzzed. So i thought I would answer her directly on my blog... I love love love his hair long- and it's at this really awkward and not so great looking stage right now- we'll be cutting it soon, but I'm hoping to grow it out a bit and have him keep it longer. Though... the other day he did tell me he was hoping I would cut his bangs "really short" so he could "show off" his brains. Nice. 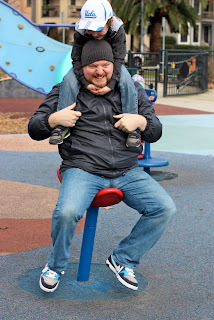 I leave you with a picture of Damien and Deacon today at the park near the farmers market (which is, by far, my favorite way to spend a Sunday morning... right after sleeping in)... they were on this little seat that went around in circles. I thought it would be a fun idea to do it with Deacon on Damien's shoulders. I come up with the BEST ideas. Deacon looks cute period! Buzz or long hair he is just as cute (handsome). And he doesn't need short bangs because I can see how smart he is without showing his forehead. That's so funny.